"Mother's and Daughter's Hands" (2017) by Jolanta Lapiak. Approx 11"w x 10h" steel+copper wire. March 2017. My second ever artwork using a wire. The little hand and foot are the actual size of my daughter's when she was about 5.5 months old. My hand was the actual size at that time, a little large shortly after I gave birth. But, since then, my hand shifted back to normal size (the same as the red handprint). The wire work was created at the time my daughter was six years old. 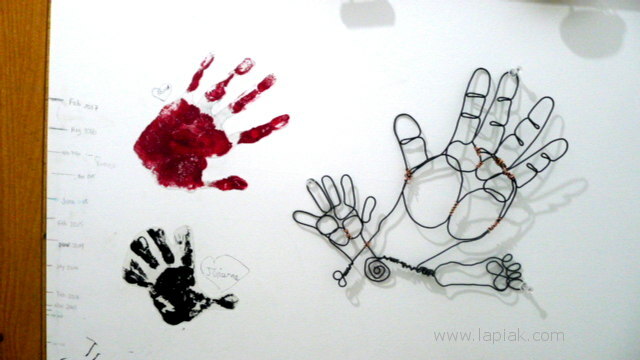 This wire art is hanged on the wall next to the handprints of the mother (myself) and my daughter. The edge of the wall shows the lines and dates of the growth of my daughter's height up to six years. This wall is located in the corner of my mini-studio, one of my few studios. "Jolanta in ASL" (2017). 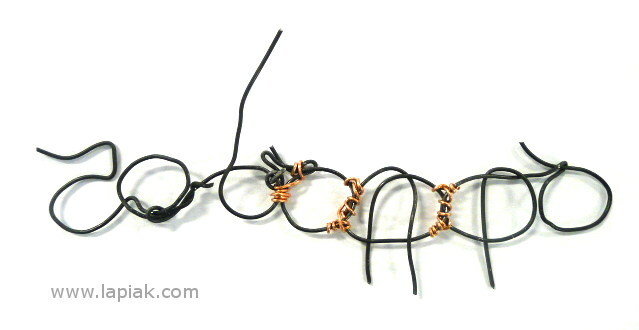 Approx 8.5"x3.5" steel+copper wire. March 2017. My first ever wire art. It's my name written in ASL (American Sign Language). Related art: ILY, Heart, Earth wire art, 2017.